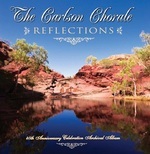 Reflections / The Carlson Chorale. Five Australian Christmas carols : second set, arranged for female voices (S.A.) / words by John Wheeler ; music by William G. James. 1 v. of music (16 p.) ; 25 cm. 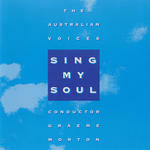 Two Australian carols : for two-part female voices (SA) / words by John Wheeler ; music by William G. James. 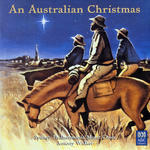 Australian Christmas carols : piano/vocal / by John Wheeler and William G. James. 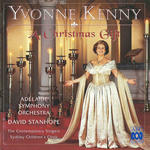 A Christmas gift / Yvonne Kenny. Five Australian Christmas carols : second set / words by John Wheeler ; music by William G. James. 1 v. of music (19 p.) ; 28 cm. Five Australian Christmas carols : third set / words by John Wheeler ; music by William G. James. 1 v. of music (16 p.) ; 28 cm. Five Australian Christmas carols : first set / words by John Wheeler ; music by William G. James. 1 v. of music (11 p.) ; 28 cm. 1 v. of music (14 p.) ; 12 x 18 cm. 15 Dec 2018: at A BOY WAS BORN (Holy Trinity Church, Launceston). Featuring Allegri Ensemble. 14 Dec 2018: at A BOY WAS BORN (St David's Cathedral, Hobart). Featuring Allegri Ensemble. 12 Dec 2015: at Carols by Queerlight (St Kilda Town Hall). Featuring Melbourne Gay & Lesbian Chorus, Melbourne Rainbow Band.